With snow blowing and almost dark at 4:30 p.m. on a Sunday, first day of daylight saving change, we turned off U.S. 24 and headed west on U.S. 50, climbing Monarch Pass enroute to Gunnison. 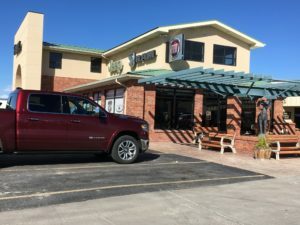 The 2019 Ram 1500 Longhorn Crew Cab 4X4 was my review vehicle, one I’d anticipated. Some automotive assessments have rated the Ram as best new half-ton on the market. As good or better than Ford? Yep. Chevy? Yep. GMC? Yep. We’ll see. To go with its more aggressive, forward-leaning front end, FCA designers have added 4 inches to the Ram’s overall length, a half-inch to the width and have trimmed 225 pounds from its curb weight. Finished in Delmonico red, the truck’s “Ram” in center of large grille spells out its identity. The second row of seats gained most of the added space. The review model contains a pickup bed of 5-foot-7 length; a 6-foot-4 box is optional. On a wheelbase of 144.6 inches, the Longhorn is 232.9 inches long. Temperatures dropped into the 20s as we drove in several inches of snow toward the top of Monarch in a line of five or six vehicles at 25 to 30 miles per hour, each of us following the taillights of the car ahead. The lead car, an SUV whose driver had no lights to follow, slid off to the side of the slick roadway at one point before recovering, then another of the cars ahead spun off momentarily. The Ram never slipped, all the way to Gunnison. The 1500 is equipped with a 395-horsepower, 410-torque, 5.7-liter Hemi V-8 engine with cylinder deactivation, 8-speed automatic transmission engaged from a rotary gear selector on the instrument panel. Beneath the dial are transfer-case choices of 2-high, 4-automatic, 4-high and 4-low. For driving in the strong winds and snow-covered roads, I set the transfer case in 4-high, locked the transmission in 4th gear with its Gear Limit buttons, and occasionally dropped it to 3rd. By gearing down, I seldom needed to touch the brakes and maintained control and more-firm footing with the Ram. 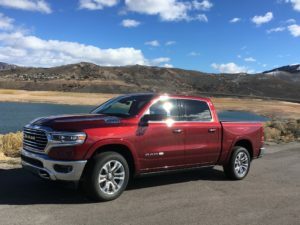 A drive on dry roads the following day gave me opportunity to test the Hemi V-8’s smoothness and power along the curves and climbs of the roads beside the Blue Mesa Reservoir of the Gunnison River on the way to Montrose. With its coil springs all around, the Ram 1500 offers an outstanding ride. The review model, with the optional four-corner air suspension, raises payload to 2,300 pounds and tow capacity of 12,750 pounds. The raising and lowering by the air suspension and deployable running boards accommodate very well the accessing and exiting of the vehicle’s passengers. The drive home on a third day was north to Grand Junction, then back east on I-70 through Glenwood Springs and Vail and home. For the 712 miles, the Ram delivered an average of 19.4 miles per gallon. That is the highest mpg I’ve achieved with a 5.7 Hemi, I’m sure. EPA estimate for the 2019 Ram is 15/21. Base engine for the Ram is a 305-hp, 3.6-liter V-6. The Ram’s $66,700 sticker price covers not only the abundant performance and a lighter, stronger high-strength steel frame, but a large, luxurious cabin, including filigree leather (stitched), Longhorn logos on seats and floormats, 12-inch infotainment touchscreen, 19-speaker Harmon Kardon surround sound, heated and ventilated front and rear seats. The Flower Motor Co.’s Chrysler/Dodge/Jeep/Ram store in Montrose. Also, a panorama sunroof, remote-release tailgate, trifold tonneau cover, parallel and perpendicular park assist and safety innovations of forward collision warning, automatic emergency braking, lane-departure warning, adaptive cruise control and blind-spot with cross-path detection. Kathy Erbacher, a former newspaper colleague, joined Jan and me for evening dinner at Ted Nelson’s Steakhouse in Montrose. Erbacher was a feature writer for special sections at The Denver Post and Rocky Mountain News before moving to Montrose, where she continued her newspaper work with the Daily Press. Earlier in the day in Montrose, we visited the Flower Motor Co., which is one of three family-owned dealerships which have operated more than 100 years in Colorado and are now overseen by fourth generation. The other families are O’Meara and Schomp/Wallace in Denver. Siblings Fritz, Fred, Noreen and Fletcher Fowler operate two dealerships, the Chrysler, Dodge, Jeep, Ram and the Subaru in Montrose. 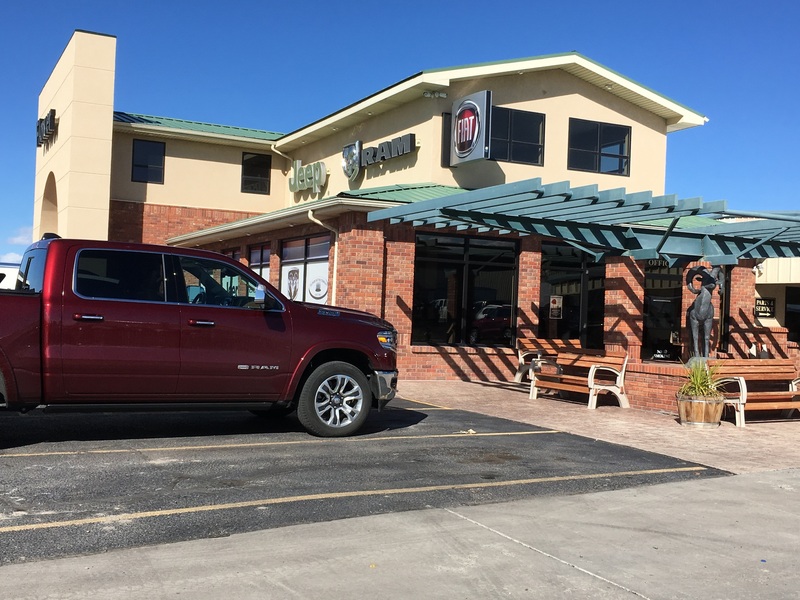 Fletcher and Fritz Fowler recently purchased the Steamboat Springs Dodge Ram business. It was in 1908 when brothers Sid and Joe Hartman acquired the Ford agency in Montrose, then switched to Dodge Brothers in 1915. More than 100 years later, the fourth-generation descendants continue with Dodge and its affiliated brands. 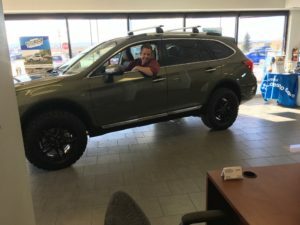 Zach Pitcher prepares to drive his 2019 Subaru Outback, with 2-inch lift, from the showroom. The Flower family recently celebrated 50 years as a Subaru dealer, and lays claim to the oldest existing Subaru dealership in Colorado. We enjoyed, at the Subaru store, visiting with Zach Pitcher of Montrose when he showed up to accept from general sales manager Jazz Janda the keys to his just-purchased 2019 Outback, which had undergone a 2-inch-lift conversion in the Flower Subaru shop. Janda said Flower purchases the lift package, including special roof rack and wheels and tires, in addition to the suspension lift, and does the installation. The package adds about $6,000 to the cost of the Subaru.